“I’ve always been involved in sports and exercise my whole life and have tried to eat “good” or at least I thought I did. When I turned 40, I had some health issues come up and needed to make some changes. I was at 30% body fat – technically the early stages of obesity. I was shocked. I always thought that I was good shape. Being a fan of MMA and following UFC, I came across Mike Dolce and The Dolce Diet. I listened to some podcasts and ordered his books and was amazed at how simple and common sense the information Mike talked about. His podcasts were inspirational and motivational. My goal was to simply get in the best shape possible whether I lost 20 lbs or 40 lbs. With two young daughters, 3 years old and 3 months old, I wanted to set an example for them about living a healthy and happy life. I also didn’t want to be tired and exhausted after 5 minutes of playing around with them. I followed The Dolce Diet principles and recipes when it came to food and exercised when I could. I powered through my obstacles by looking at my before picture and being disgusted with how I looked. I food shopped on Sundays and prepared my food for the week so there were no temptations or no excuses for getting off track. I believe that is the number one thing anyone could do, prepare for success. If you fail to prepare then you are preparing to fail. I also reminded myself that it is a lifestyle, a journey, that you need to have patience and that it won’t happen overnight. I remind myself everyday to be 1% better than I was the day before. I started at 175 lbs at 30% body fat and today I am at 143 lbs at 13% body fat. 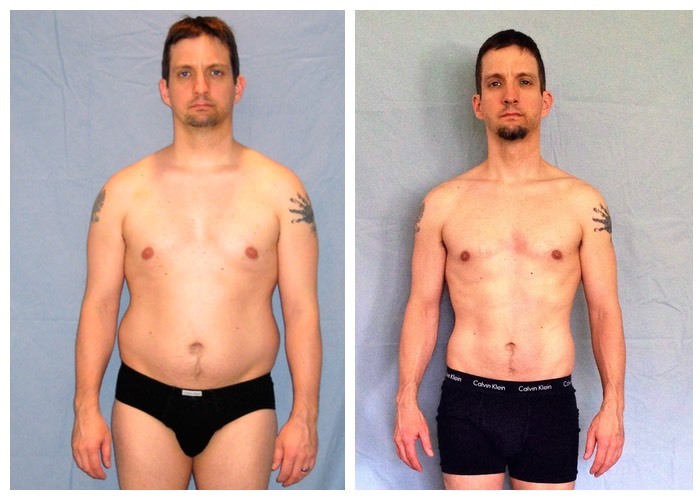 Thanks Mike, Brandy and The Dolce Diet!” – Keith Kuratko, 42 y/o, followed Living Lean.